I hope everybody gets the chance to pop over to Facebook and check out our new and improved page for Indie-Debut 2010. It was time to switch, so we could incorporate our blog feed, post links, and take part in some really great discussions with our readers. The Facebook group is open to EVERYONE (readers, authors, parents, teachers, librarians, etc...) who supports small presses and would like to follow some authors along on their journey of publishing with a small press. But hey! It's not just about us. (we're not that selfish!) If you're an author published with a small press, we invite you to introduce yourself and tell us a little about your book. 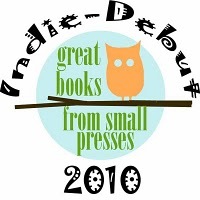 We want this to be a place where we can share great books from small presses (did you check out our logo?? ), talk about our experiences working with small presses, share tips and ideas to market our books, and just plain have fun!